When Paul was 8 years old, a distinguished gentleman, General Winfield Scott visited New Orleans. He requested that his hosts find a strong local chess player for him to play. Chess was an infrequent pastime of Scott's, but he enjoyed the game and considered himself a formidable player. After dinner, the chess pieces and board were set up and Scott's opponent was brought in. 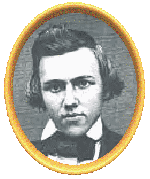 He was surprised to see a skinny eight-year-old, Paul Morphy, dressed in a lace shirt and velvet knickerbockers and looking like anything but a ferocious opponent. Seeing the youngster, Scott was at first offended, thinking he was being made fun of. When his hosts however assured him that his wishes had been scrupulously obeyed, and that the boy was a "Chess prodigy" who would tax his skill, Scott consented to play. To General Scott's surprise, Morphy beat him easily not once, but twice. The second time, the boy announced a forced checkmate after only six moves. Two losses against a small boy was all General Scott's ego could stand. He declined any further games and retired for the night, never to play Morphy again." Morphy was like Capablanca. Brilliant even as a young child. Didn't need tons of chess books. Game just came natural. Some people just have it.